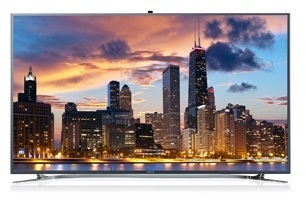 The Samsung UN60F8000 is the pinnacle of 60" 3D LED Smart TV's that Samsung has to offer. Released this year (2013) The technology behind the Samsung UN60F8000 great exceeds the competition for big-screen TV's. The Samsung UN60F8000 is equipped with quad core processor, giving this television computer-like features. As such, the Samsung UN60F8000 offers users "smart interaction" features that are, well, beyond intelligent for a TV. TV users are able to give the Samsung UN60F8000 TV commands by voice and hand signals. This ingenunity alone as evolved the marketplace for HDTV's as we know it. The Samsung UN60F8000 also offers "smart evolution", a feature allows users to make updates the Samsung TV as they are released. For the TV junkie who always needs the latest and greatest model, this feature makes replacing the Samsung UN60F8000 an obsolete task. The Samsung UN60F8000 also offers a clear motion rate of 1200 for fabulous image quality, as well as precision black dimming and micro dimming capabilties. For audio quality, the Samsung UN60F8000 TV provides superior sound with a DNSe+ system built right in. Adding to the level of Smart TV intelligence, the Samsung UN60F8000 TV enables users to browse the Internet with ease. With a 60" monitor, watching YouTube videos or sifting through images can be greatly enhanced. With all these features as part of the complete Samsung UN60F8000 package, it's without a doubt the highest quality home entertainment system available on the market. As for price, the Samsung UN60F8000 is actually pretty well-priced for being a 60" LED Smart TV with 3D viwing capabilties. The best deal we could find for the Samsung UN60F8000 was at The High Definition Store for $2,797 (an unbeatable deal for the high performance Samsung UN60F8000.) In addition to the Samsung UN60F8000, these guys seem to offer some of the best prices for a wide variety of Samsung TV's. Stay in-tune with Technology Scribes for more awesome reviews. We plan to cover additionall Samsung TV models in the future, so if LED/HD/Smart TV's is your thing, then we've got you covered.